When you start planning energy efficiency projects, usually the first things on your agenda are HVAC systems and lighting, right? The roof doesn’t usually make the top of the priority list. In reality, the roof most assuredly affects the money spent on heat and cool a building. The key to energy efficiency in a roof is heat transfer. Roofs bake in the sun all day, absorbing heat from the infrared and near infrared components of solar radiation. Some of this heat is given off but some are transferred into the building. Conversely, the roof cools in the night and transfers heat from the interior of the building to the outside air. This heat loss or heat gain directly affect energy use. Logically speaking, the less heat transfer, the less the HVAC system needs to run. Thus the more energy efficient roof is the one that contributes the least to heat transfer. To understand energy efficiency in roofing, one needs to understand some terminology- reflectivity, emissivity and thermal conductance. Reflectivity is the ability of a surface to cause radiation to bounce off rather than absorb. Emissivity is its ability to release what has already been absorbed. Thermal conductance is the materials’ ability to transfer heat through itself to another material. Each of these three concepts will influence the heat transfer of a roof and impact the energy costs of a building. Any type of roof system can be cool. Although the TPO and PVC single plies are best known for their reflectivity, most other roofing system manufacturers have developed reflective versions of their traditional roofing systems. 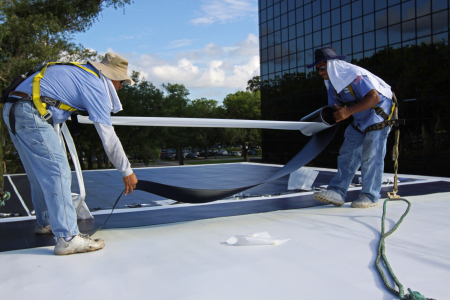 EPDM manufacturers have developed pure white EPDM systems. Built-up system manufacturers have developed pure white systems including white adhesives and aggregates to provide reflective surfaces. Modified bitumen roofing manufacturers have developed new cap sheets that are blindingly white next to the traditional light gray granule surfaces. Almost any roof, new or existing, can be made into a reflective roof by applying coatings to obtain the solar reflectance values needed to comply with California Title 24, Energy Star ratings or LEED certification. On a side note: A roof does not have to be white to be reflective. Research into heat-reflective clothing for military use has resulted in colored pigments that reflect infrared and near-infrared radiation. This has been adopted by the roofing industry to provide colored alternatives for reflective roofs. Some TPO single ply membranes have also included this technology in their formulations, allowing bright colored materials as well as light ones.